"Detroit Rock City" and "Shout It Out Loud" from 1976's classic "Destroyer," sending the public into madness. Then another song from the golden age of KISS: "Calling Dr. Love." Gene Simmons took the lead vocals for the first time, enchanting the crowd with his charisma and stage presence. After a series of songs from albums that came out during a time before many of us were even born, behold, the band featured two tracks from the new album "Monster." "Hell Or Hallelujah" live is powerful and exceeds the excellence and quality of the studio version. Before beginning the fourth song, Paul Stanley exuded showmanship when interacting with the public, who were going berserk in the Arena. "Wall Of Sound," although it is not a single, was warmly received by fans. Then, there's nothing like "Hotter Than Hell" coming next in sequence, and the song's title summarized what it was like on Saturday in Sao Paulo: hotter than hell. The track from the album of the same name by 1974 showed that, even if some fans didn't know every lyric, the chorus was on the tip of everyone's tongues. 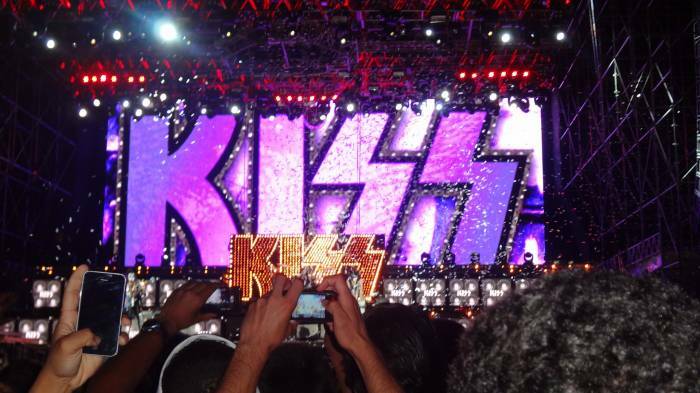 When it comes to KISS, respect and admiration between the band and its public are mutual. The quartet, especially Paul Stanley, paid many compliments to the fans who were present at the show. In one of the most striking moments, Stanley said he had been in Argentina and in Chile, and the audience booed, of course, -- but soon after he said Sao Paulo is the number-one city, sending the audience into a frenzy. The show continued with "I Love It Loud," the flagship track from "Creatures of The Night," which was last played on Brazilian soil in 1983 and again was heard tonight. 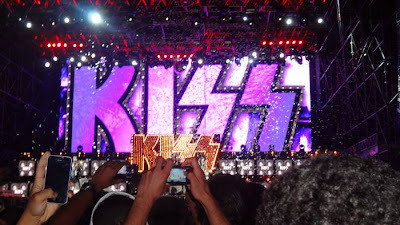 The track, sung in unison by fans, has not aged at all, and it shows that it is one of the best highlights of the KISS show. When you have the intensity of Eric Singer's drumming true to the original version, and Gene Simmons singing too (to many, a Rock God on Earth,) the song had the audience singing every chorus. Without a doubt, it was one of the most memorable moments of the show. Paul Stanley showed again that he is a frontman who inspires love from his audience. When introducing guitarist Tommy Thayer, he asked that Tommy's name be shouted, and it was with a standing ovation. The spotlight was appointed to Thayer who sang "Outta This World," the third track from "Monster" in the repertoire. Then he split the stage with Eric Singer to entertain the public with skilled guitar solos and pyrotechnic effects added to the drumming, right up to a Bazooka handled by Singer that shot jets of fire. Moreover, the visual spectacle presented by KISS has not received enough due attention. Fires and fireworks are spectacular effects in the show, but when Gene Simmons takes a simple bass solo into a state of possession, spitting blood and pleasing the audience, finally being suspended at the top of the stage to sing "God of Thunder," it causes chills. After the surreal Gene Simmons demon had been exorcised, Paul Stanley brought his voice to sing "Psycho Circus," his feet leaving the stage often. This was another prominent moment in the show when the effects perfectly matched the music. Paul Stanley flew off the stage toward a platform to sing "Love Gun" with the audience, who was singing with full lungs. How could you not find this fantastic? "Black Diamond," whose chords were anticipated after the introduction of Led Zeppelin's "Stairway to Heaven" closed the first part of the show. But shortly before, Stanley asked if the audience wanted to hear more songs from KISS. The audience already gave that answer a long time ago. The crowd, who shouted the name of the band during the absence of the quartet on stage, was presented with two more pop hits from the band: "Lick It Up," that pleased even the older fans of the band, featuring more snippets of The Who's "Won't Get Fooled Again," and disco hit "I Was Made For Lovin' You," resulting in excitement among the women present. To close the show, after little more than an hour and a half, could there be any song but "Rock 'n' Roll All Nite?" While the fans were presented with the rock anthem and sang along extensively, a shower of fireworks and shredded paper illuminated the dark sky of São Paulo's cosmopolitan night. KISS has enjoyed an almost forty year career and numerous members over several turbulent phases. When the quartet gets together with the simple goal of playing rock'n ' roll and entertaining the public, they show that behind the strong and striking makeup, there are four music entities able to make everyone from children to girls paint their faces in an effort to be close to their idols. Fans left the Anhembi Arena with smiles on their faces and repeating the name of the band. A night that won't be forgotten.